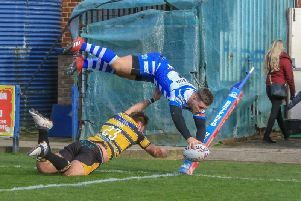 Halifax coach Richard Marshall was full of praise for a remarkable defensive performance after his side toppled Championship leaders Batley in a Mount Pleasant quagmire. Fax led 6-2 at half time against the Bulldogs, with all the game’s points coming in a three minute spell before the break as Australian half back Matt Place’s try and Steve Tyrer’s conversion cancelled out a Scott Leatherbarrow penalty. The visitors then kept their opponents, who went into the game with a two-from-two record, scoreless in the second period, despite playing up the venue’s famous sloping pitch. “Our enthusiasm and determination in defence, to get in their faces and try and force an error, was what got us home,” said Marshall, who brought Jacob Fairbank, Tommy Saxton and Adam Robinson into the side that had lost to Leigh a week earlier. “That was the difference; it was tough towards the end and they could have sneaked it, so we’re very pleased. “There are lots of excuses that we could have used as coaches or players; the slope was against us, it was muddy, we were playing into the wind. “To be honest, when you get to our level, you have to put that to one side and just play the game. “We knew at half time we weren’t going to get much good field position in that second half, so we knew we had to back our defence. “We had to defend strongly and resolutely, improve our kicking game, keep the ball in play and try to make them come up with errors. Marshall was less content with his side’s error count, which only subsided in the last quarter of the game, although he insisted he would continue to encourage his side to push the pass. “We need to be smarter with the ball and we got smarter as the game went on, to the point where the last 20 minutes was the best we played,” he said. “From a coaching point of view, it was good to see how we improved. Captain Scott Murrell was the key figure in the closing stages, with some impressive kicking in open play, and Marshall also picked out former Bulldogs number one Miles Greenwood and young winger James Saltonstall for praise. “I thought our full back was very, very good,” said Marshall. “One of Batley’s strengths is their kicking game and I thought they did that very well, but Miles and James never really looked in trouble.